Today, many e-Commerce sites are implementing services that collect data from visitors in order to increase customer satisfaction that leads to sales. But have these efforts produced the expected results? In this article, we cover a new web service called “Fanplayr”, that is described by their partner, JAMU Corporation, as the market data platform for e-Commerce. What makes Fanplayr different from other Web services is that it focuses on “delivering increased profits from each visitor”, by behavior analysis, creating accurately segments, and taking action in real time. Thus, it maximizes profit by better alignment with the intent of each shopper. I talked to Fanplayr Founder, Derek Adelman and Jamuinc CEO, Hideaki Ueda. “If a retailer doesn’t see results from web service or other MA (marketing automation) product, it is usually due to a failure to properly interpret and act on the data that is being communicated by visitor activity,” Derek says. Although historical data may suggest a certain approach, these approaches frequently do not deliver results unless actions can be taken in direct response to visitor activity in real-time, rather than blindly timing the same message based on a pattern. Fanplayr incorporates concepts used in financial transactions to e-Commerce; to analyze a large amount of data collected in real time in order to read, understand and act on visitor behavior. For example, let’s assume that there are four visitor types: “those who will definitely buy”, “truly casual browsers who have no intention to buy”, “site abandoners” and “would-be customers who are hesitant or lost”. Assuming that we can distinguish these, which ones should we take action in order to encourage a purchase? So who is the one who should take measures to boost purchase such as distribution of coupons and price reduction of shipping fees out of these? The answer is the latter three: the casual, the abandoners and the hesitant/lost. Many EC sites typically present coupons to anyone at all or even target “those visitors who definitely will buy”. The act of giving offers without regard to purchase intent is simple re-pricing and reduces profit margins without significant improvement to number of customers. Fanplayr correctly analyzes the purchasing behavior of the user, and selects actions according to the situation of the user. In this case, you maximize profit by taking action to encourage a purchase when the visitor is not so committed and “do nothing” for customers who look like they will “buy anyway”. The following chart represents the 2016 calendar year performance on an apparel site that runs Fanplayr. 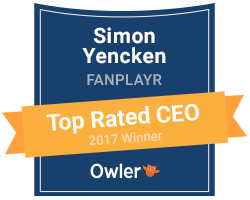 According to this client, Fanplayr segments successfully isolated 19% of visitor traffic that accounted for 87% of the total revenue during 2016. 4 of the 19 percentage points of this visitor traffic were “definite buyers” showing purchase intent. They brought in 56% of the total revenue and were not presented an offer from Fanplayr. A further 6% and 9% of traffic represented casual/hesitant and site abandoners. These segments were targeted by Fanplayr offers and accounted for an extra 31% of revenue (17% and 14% respectively). This shows the strength of Fanplayr. In summary, Fanplayr looks to make a significant contribution to the profit of an e-Commerce site by correctly judging the behavior of each visitor and taking precise action. Derek emphasizes that this is a pay-for-performance business model, as opposed to a pay-to-play model, whereby Fanplayr has a direct stake in the success of each campaign. As such, this is not simply a tool that relies on the customer making optimal use of its features, but rather is a service that delivers results based on best practices seen in various verticals. By implementing Fanplayr, you will be able to collect data, analyze and take actions that drive profit with minimal effort. This is worth considering for those of you spending time and effort managing your own service and are concerned about maintaining or increasing margins as visitor traffic gets more expensive.